Digital business: when Internet went from I.T. to Marketing. In the 60’s, Internet was not a dream anymore but a strong technical reality. Since then the World Wide Web developed rapidly and today, we cannot live in a world without internet. Of course today’s web activities have nothing to do with the first nods connected several decades ago. In the last 10 years, Internet evolved exponentially. From an I.T. pure activitiy driven by technology, today, internet became a marketing and business activity. The added value went from informatics infrastructure to be placed in the user experience and customer management. Since the beginning of web activities within companies, the I.T. department became almost a second General Direction department. In deed, technology was key and hard to master. It also happened at the time in which computers invaded all companies, so IT had a strong role internal and external. The iconic role of the webmaster was born. In deed every website had a Webmaster. Only in the name we would imagine a living god or at least someone between Thor and spiderman. Finally, it was more someone who could understand the challenges that many companies were facing in order to provide the best web technology. The investments were so huge, especially at the big companies that I.T. became either part of the General management or close. Internet became a global industry and the Business units inside the company started getting interested, especially Marketers. And in 1999, the web 2.0 was created. And this dramatically changed the way to approach the web and it started new internet activities. What is the web 2.0? This terminology was created in 1999 and the goal was to describe the evolution of simple static web pages. It was the start of a new generation of the world wide web in which the user experience was multiplied by 100 in terms of interactivity, disponibility and sophistication. While the beginning of internet was focusing on hardware, the web 2.0 was focusing on software. The “what to use” was getting overcome by “how to use”. The web 2.0 is built thanks to a rich user experience, even a user as contributor. We focus on the long tail rather the 3 key metrics. The relationship with the users are based on trust and it is everywhere: at home, in the office, on the dashboard of your car as well as on the watch at your wrist. Web 2.0 was also the original field for the Social Media revolution. In deed the interconnectivity and the user participation as content producer, created an open area for Social media to arrive. In deed, If Internet was a evolution, Social media is THE revolution. There was a before and after social media. Society does not communicate and interact the same way than before. What differentiates Social media from the other media? It is an abreviation of 3 letters: U.G.C. = User Generated Content. And this is the mighty power of it. Every person in this planet can produce content for the web, so the web does not belong anymore to a few people sitting somewhere in high towers. The World Wide Web became finally …. world wide. Companies are massively investing their money on Social media and on web interaction. They know that the key for success is to place the customer on the center of everything. In 2012, companies used to invest around 10.6% of their total revenue. This budget should increase by 10% in 2013. In comparison, I.T. budgets were around 5% in 2012 of total revenue and should stay stable this year (source: gartner.com). According to Marketingweek.co.uk, Marketing budgets in 2013 will become just Digital Marketing budgets (a part the product development of course). Luxury companies understood finally that Internet is not a bad quality channel, despite being a mass-media. Actually, they know that by investing the correct amount, they can finally express their brand territories the way they wish and not as the Distributor wants. Companies like Chanel, Prada, Burberry or Cartier, develop specific communication campaigns for online exclusively which make them very powerful as a Brand. And in these examples, Marketing definitely took over IT in terms of added-value. Why IT lost its role ? As the new web approach was to invest more in marketing and communications, budgets on those fields extremly increased in the past years, and project owners, the stakeholders, were now on those 2 departments. IT budgets did not evolve and as technology evolved faster than the I.T. teams inside the companies, there was also an externalization phenomenon. According to Ludovic Mauconduit, e-Technology Manager at Kalyss SA, the I.T. department in a company lost their role of decision makers towards a role of execution. In this role, the limitations in terms of added value are obvious. The I.T. department is requested to execute, most of the time simple tasks as most of the time. The Business units make briefs to external Digital marketing agencies that provide the concepts and the execution of those concepts. So most of the time, the I.T. department just execute simple tasks like DNS openings, sub-domain creations, etc… What Mr Mauconduit explains, is the need for a change of attitude. Short term projects and short timing. For these reasons, the I.T. Department needs to be involved on the project definition and finalization. They own the Technology inside the company, so they should be able to support projects also with guidance. No one and everybody at the same time. Business units went very often “their way” without trying to bring the right internal teams together. They need to integrate the I.T. department from the birth of a project, in order to have a good start. Often, I.T. has resources that Business units do not have. They also have a global vision of the impacts of new projects on the company’s infrastructure. On the I.T. side, the current teams need to understand that their own jobs evolved from managing hardware towards Service provider. Service in terms of bringing solutions, providing consultancy and manage delicate global projects that only I.T. would have the possibility to do so. Without any change, the company value in terms of technology will decrease. Many topics around Internet are more and more outsourced to third-parties, and the risk here is that the knowledge and investments will escape the company to the profit of the external partners. Not so sure that a magical solution exists. But there are a couple of things companies should put in place in order to prepare the current and future challenges. The first approach is to integrate I.T. into the project genesis. This can happen by having a strong Project Management office in-house. In deed PMO, can easily align internal resources in order to achieve a common goal. Business units need to start investing more into internal resources rather than contributing to the profits of so many external companies. So the I.T. manager should be the Marketing Director’s best friend! The second approach is to provide an efficient and leading role to I.T. as technology stakeholders in-house. The I.T. department will need to evolve in terms of teams and roles. As explained, I.T is no longer a Hardware keeper, they are now in the position of Technology consultants. This means the nature of the teams will evolve, new roles will be created and an attitude towards Business will be used. The War for Digital Talent. According to a Forrester study about Digital teams in leading companies, the study showed that 60% of companies have Digital teams with less than 10 people. When you see that start ups like Google was back in time, have been leveraging digital talents for years, the rist here is to become a “big boring mammoth”. Optimized cross-channel user experience. This is basically what should we be focusing on everyday. And though, we realize that many companies are very weak in Mobile or in integrating off-line and on-line strategies. Focus on the head rather than the long tail. For a Digital marketer, this one is a hard one. Every digital marketing expert would tell you: Focus on the long tail as it will be much more cost efficient and you will grow your digital business in a sustainable way. But we often forget about the total amount of resources requested for that. Do companies have enough resources to focus on the hundreds of small blogs and queries rather than focus on the 3 main big ones? You might be happy to pay a certain amount to focus on the head, rather than finally spend much more to target the long tail (need of more people in-house or external agencies). Internationalization. The fact that emerging markets represent a huge opportunity for growth and the second fact that our home markets are already saturated with Digital marketing, bring the company to review its strategy and sometimes even to modify offices locations. Finding the right digital talents is also crucial as countries like China or Brazil will need local support. GAFA, Google, Apple, Facebook and Amazon. 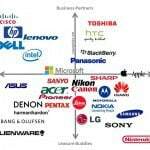 Everything you will do in your digital professional life will be in competition with something these 4 companies do. Or at least you might need something from them. And to being able to run projects at this level you will need I.T. trust me. Personalization. This might be one of the most important words in the Digita world today. Customers wish to browse websites proposing self-aware services and customized experiences. It should be like magic. Customers would find everything they need, the way they need. And they will be very happy to give their personal data for that. So imagine the technological back-office you need for that! I could continue on and on with Social Media, SEO, Owned Content, Conversion rate optimization, mobile or even Advertising. But I think you got the point. Only companies that will generate a vertuos alliance between Business and I.T. will be ready for the future challenges. Info sourced at wikipedia, techrepublic.com, Mashable, Forrester, econsultancy.com, Lemonde, quoted Brands websites. All content is copyrighted with no reproduction rights available.